“This Veterans Resource Fair provides access to a number of key services such as housing programs, employment training opportunities, and other resources available for our veterans and their families in one convenient location,” said Rep. Linda Sánchez. “It is great to host this event at the new and beautiful Liberty Community Plaza since it was designed in part to honor our local veterans. I want to thank Supervisor Don Knabe and his office for their assistance and support of this event. We are proud to work together to ensure our veterans receive the benefits they have earned through their service to our nation. “Whether it is hosting these kinds of events or providing assistance with backlogged VA claims, my office is always here to help all those who served our country in uniform,” concluded Rep. Linda Sánchez. RSVP: Reporters/photographers interested in participating should contact Jeff Sanchez at Jeff.Sanchez@mail.house.gov or (202) 225-6676. 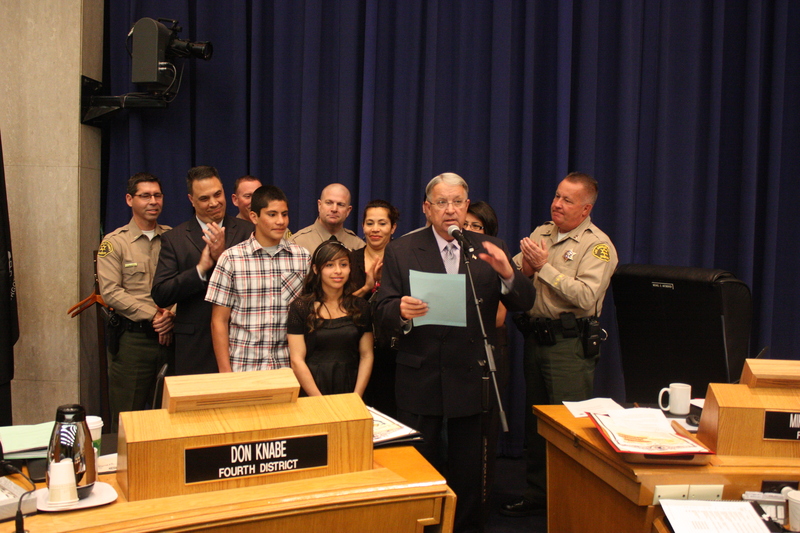 Supervisor Knabe honored Lorraine Villalobos and George Acosta at a recent Board of Supervisors meeting. Lorraine is the current 2010/ 2011 Western United States Silver Gloves Champion and California State Champion; and George Acosta is the 2010/2011 California State Runner Up for the Silver Gloves Championship.